The guided missile destroyer USS Mustin is taking part in joint military exercises with South Korea. (CNN) -- Amid heightened tensions with North Korea, the United States and South Korea on Sunday began joint military exercises, according to a spokesman for U.S. Forces Korea. The military exercise, dubbed Invincible Spirit, is scheduled to run through Wednesday and demonstrate the alliance's resolve. In addition to the 8,000 personnel involved, military officials say, it will include 20 ships and submarines and about 200 aircraft. 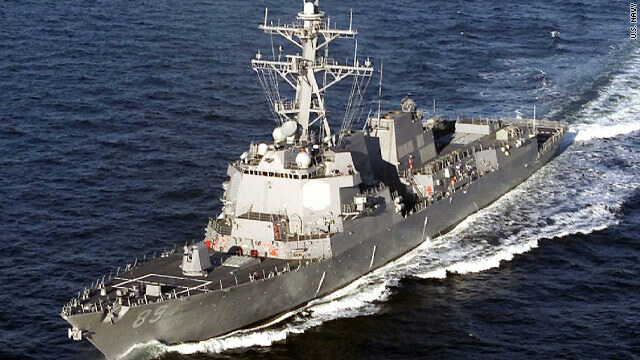 The U.S. Defense Department said the drills are in response to the sinking of the South Korean warship Cheonan and are intended to send a strong message to Pyongyang to stop "provocative and warlike acts." North Korea criticized the exercises, which began at 6:30 a.m. (5:30 p.m. ET). "The U.S. provocations amount to trespassing on the off-limits fixed by the DPRK and it, therefore, feels no need to remain bounded to the off-limits drawn by the U.S.," the state-run Korean Central News Agency quoted a North Korean foreign ministry spokesman as saying. It continued, "It is the mode of the DPRK's counteraction to react to sword brandishing in kind. The DPRK is prepared for both dialogue and war. It will remain unfazed by military threat and sanctions." The carrier USS George Washington and South Korean carrier Dokdo will lead the naval aspects of Invincible Spirit on the eastern coast of South Korea, said U.S. Army Col. Jonathan Withington of USFK. North Korea on Saturday heightened its threats against the military exercises after talks over the sinking of the Cheonan. North Korea "will legitimately counter with [its] powerful nuclear deterrence the largest-ever nuclear war exercises to be staged by the U.S. and the South Korean puppet forces," KCNA reported. Two U.S. military officials told CNN there was no sign of significant troop movement in North Korea. Meanwhile Friday, in the demilitarized zone between the two Koreas, officers from the North sat down for talks about the Cheonan incident with their counterparts in the U.S.-led United Nations Command. During the almost two-hour meeting in the international truce town of Panmunjom, the U.N. Command reminded the North Koreans of the Security Council's condemnation this month of the Cheonan attack. The Security Council did not mention North Korea by name but condemned the attack strongly, called for "full adherence" to the armistice agreement that halted fighting in the Korean War in 1953 and encouraged "the settlement of outstanding issues on the Korean peninsula by peaceful means." An international inquiry found North Korea culpable for the March attack that killed 46 South Korean sailors. But North Korea denies a role in the incident, which elevated tension between the two enemies. North Korea demanded again Friday that it be allowed to conduct its own investigation of the Cheonan's sinking and said the upcoming war games are being conducted under false pretext. "The U.S. forces side would be seriously mistaken if it calculates it can browbeat [North Korea] through large-scale war exercises," KCNA said. "It should immediately stop the [anti-North Korean] nuclear war racket." At the ASEAN meeting, nation after nation expressed deep regrets and offered condolences to the South Koreans. The United States has accused North Korea of aggressive behavior and imposed new sanctions Wednesday. Secretary of State Hillary Clinton reiterated U.S. support for South Korea on Friday. "Here in Asia, an isolated and belligerent North Korea has embarked on a campaign of provocative, dangerous behavior," she said in Hanoi, Vietnam. Later, after a repatriation ceremony for the remains of three soldiers who died in the Vietnam War, Clinton said the door remains open for dialogue if North Korea commits to abandoning its nuclear weapons program. "We would love for them to have the same opportunities that the people of South Korea have been able to enjoy for the last 60 years," Clinton said. "So, it is distressing when North Korea continues its threats and causes so much anxiety among its neighbors and the larger region." CNN's Barbara Starr and Eve Bower contributed to this report.